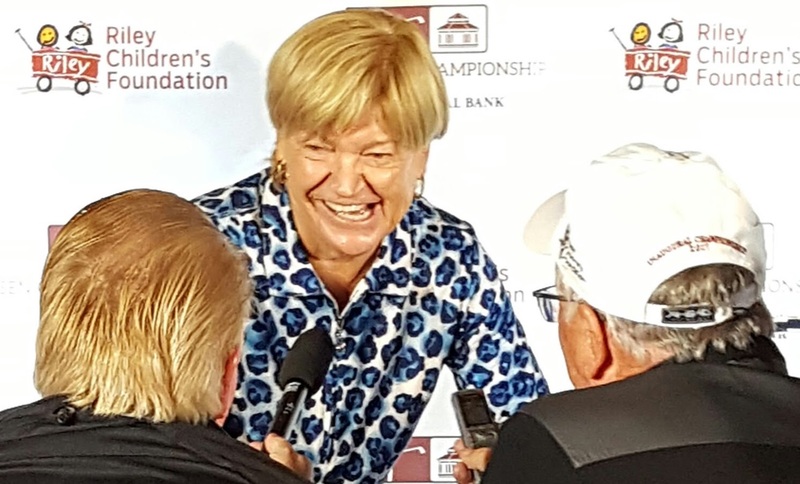 Jane Blalock, getting grilled by the media before the 2017 Senior LPGA Championship at Indiana’s French Lick Resort, is the guiding light behind senior golf for former LPGA players. Jane Blalock, who provided the only tournament options for Ladies PGA members once they reached the senior ranks, was – most appropriately – among the first two special exemptions into the first U.S. Senior Women’s Open that will come to Chicago Golf Club in Wheaton in July. The U.S. Golf Association also issued a special invite to Mary Jane Hiestand, the runner-up in last year’s U.S. Women’s Mid-Amateur Championship, on Wednesday but Blalock’s inclusion in the July 12-15 event on America’s first 18-hole course was more significant. Blalock, 72, was the LPGA Rookie of the Year in 1969 and went on to win 27 times on the circuit. Though ranked 19th in all-time victories, Blalock did not qualify for the USGA’s first national championship for women, both pros and amateurs, in the 50-plus age group. In 2000, after her days as a mainstay on the LPGA circuit were over, Blalock organized the Legends Tour. It welcomed players who had reached their 45th birthday, and the circuit could muster only a few tournaments a year until 2012. Seven were held that year and 13 the next. In 2013 the circuit had its first major event – The Legends Championship at French Lick, Ind. – and that event grew into the first LPGA Senior Championship last year. It was the first Legends event to get formal support from the LPGA as well as TV coverage. The U.S. Senior Women’s Open will be the second major for senior women. It’s open to both professionals as well as amateurs with a handicap of 7.4 or better. The finals at Chicago Golf Club have 120 players, most determined at a series of nation-wide qualifying rounds. Many of the former LPGA stars won’t enter, however, because it’s a walking-only event. Blalock planned to enter, even if she wasn’t awarded a special exemption. Senior women’s golf has seen a dramatic upgrade in the last three years. The last Legends Championship of 2016 was played over 36 holes and had a $75,000 prize fund. Last year’s first LPGA Senior Championship was played over 54 holes and had a $600,000 purse. The first U.S. Senior Women’s Open is a 72-hole event with a $1 million purse. Scotland’s Trish Johnson won both the last Legends Championship and first LPGA Senior Championship. Her prizes for winning were $37,00 in 2016 and $90,000 in 2017. The champion’s share of the Senior Women’s Open purse hasn’t been announced.